PREMIUM QUALITY: Manufactured to Acko standards, made from tough & durable lightweight plastic. EASY TO USE: Designed fold easily and quickly, Just pull up the handle and push in the sides, the Acko folding stool is great for use indoors and outdoors, kitchen bathroom or the garden. CARRYING HANDLE: Ergonomic carrying handle allows for easy and comfortable carrying allowing you to take the step stool anywhere. 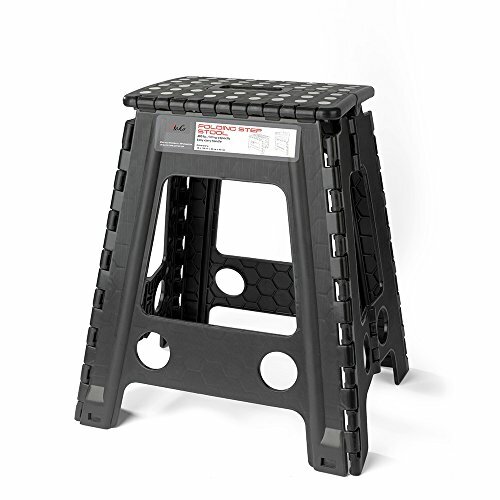 SQUASH PROTECTION FEATURE: Acko have designed a safety stop gap feature that allows the foldable stool to prevent being squashed, great for kids. ANTI SLIP: Special rubber dots on the surface and anti slip surface on the feets help stabilise and prevent slipping, especially around the kitchen bar, bathroom areas.